The Trust’s first major building restoration was the rescue of Ladybellegate House, an 18th century Grade 1 listed building containing fine Rococo plasterwork and a carved oak staircase. In 1978 the Trust acquired the house from the GPO, which contributed towards its restoration. We obtained a loan from the Architectural Heritage Fund and promoted a successful appeal for further funds. The house was reopened by HRH Princess Anne in 1979. Following the successful sale of Ladybellegate House, a building preservation trust was formed on 9 May 1980. 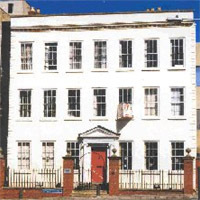 Gloucester Historic Buildings Ltd is a joint charity of the Trust and the city council. Go back to Gloucester Civic Trust achievements or read about saving and restoring the Crown Inn.